We LOVE salmon in this house, but with this recipe just about any nice fish would do...thick cod, halibut and sea bass all come to mind! 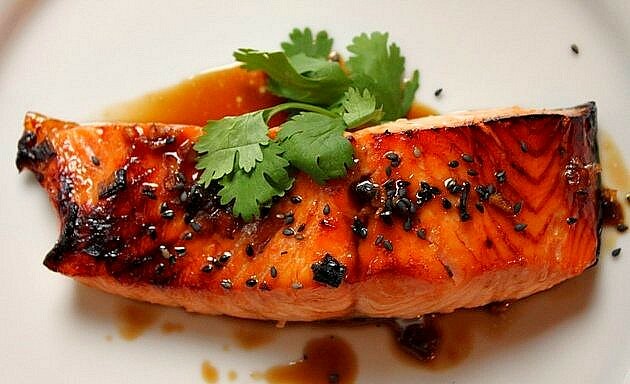 Don't allow the, "blackness" on top of the fish to fool you, this Broiled Salmon with Miso Glaze is cooked perfectly! Miso (a thick paste made from fermented soy beans) is a staple in Japanese cooking. Slightly "charring" miso only enhances its uniquely savory and sweet....earthy delicious flavor! ~this is an old photo I took...just keepin in real! Keep an eye on the fish while under the broiler, the piece of salmon I used was pretty thick (approx 2 inches) and it sat under the broiler about 9 minutes...after I thought it had just blackened enough, I turned the broiler off but allowed the fish to remain in the oven about 5 minutes longer ~ this ensured the salmon was cooked through and cooked perfectly! I used haricots verts (skinny French string beans) and cooked them up in a small pot of boiling water, about 5 minutes. Then I drained the water and added the beans back to the same small pot. I drizzled some sesame oil over the top (about 1 tsp) and over high heat, continued cooking the beans until softened but still a bit of a crunch, about 3 minutes longer. A tiny pinch of kosher salt OR splash of soy sauce over the beans at the end is optional, but does heighten their flavor! Serve with your favorite brand of Jasmine Rice cooked according to package instructions. I plate my rice by firmly packing the cooked rice into a small bowl or ramekin and then inverting onto the dish. Sprinkle the entire dish with toasted black sesame seeds, sliced scallion and/or cilantro. The pictures are amazing ... looks delicious and I am not a fan of salmon! I'm not a fan of salmon either, but I LOVE various white fish, so I'm saving this recipe for some night when the family is in a fish mood. We're big fans of green beans too, so I'll try your method for preparing them. I personally am not supposed to have white rice so I'd have to use brown, but I was wondering if there's any particular way you prepare your rice? Broth or water, any other seasonings other than the black sesame seeds/scallion/cilantro? Thanks for the comments! It's funny because when I went to plate the dish I thought it was going to need some sort of sauce, but the miso glaze and ginger on the salmon...with the soy and the mirin make the fish SOOO flavorful and then the sesame oil and dash of soy on the beans pulls it all together! Be sure to not overcook the fish. As for the rice, I keep it super simple. Just rice and water - no butter, salt or oil! I bring the water and rice to a boil, then turn down the heat to a simmer and cover for about 10-12 minutes. I also cook my rice on the smallest gas burner on my stove, I've found it cooks best on that burner. If you can't do white rice a nice Brown Ginger Scallion Rice would be delicious with this too! Or the fish and beans can stand just fine on their own! It's one of those dishes where if you have miso and mirin on hand (which I did) it's so simple and comes together quick! We also looooove salmon but I never make a fancy sauce for it! I SHOULD, huh?!!!!!! Looks amazing! I love cooking with miso...adds such great flavor. Definitely need to try broiling it. The salmon sounds wonderful too. 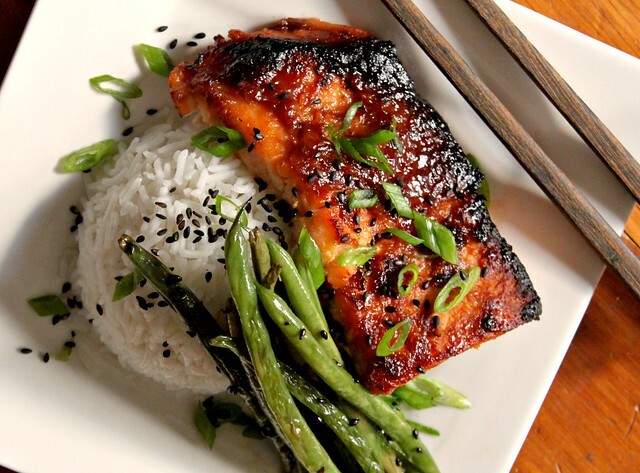 I recently had a miso glazed grilled piece of salmon at a friends and LOVED it! Will have to try this soon. Holy Toledo can your pics get any more gorgeous?!? I hate you. Not really of course, but just a little. You've outdone yourself on this one sister. I am sure from the looks of it that it tasted heavenly! I love salmon!